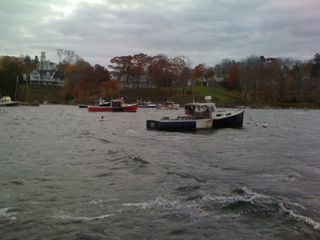 Here is the port in Rockport on this windy rainy day. 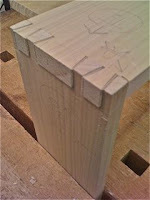 This is my 2nd set of dovetails of the day. The first were actually better but there were fewer pins. The methodical practice quells the fears. I used to just get terribly frustrated but now I'll finish a set, cut them off and start over, hoping to remember everything I did wrong and everything I did right. Ok, did it. What I said before I got erased was how great your writing is and how fun to be thrust into the exotic world of Maine and furniture making and 8/11ths measurements.